Love at first sight. It’s what I felt when I saw the pictures of this Dutch house I show you today. A cheerful home and very cozy, bright and special, as the use of white as the main color and pastel touches make it a place where, as I always say, want to be. If you like the quiet and lively decor, you cannot miss the tour that I offer this home that invites you to sit, relax and live calmly. 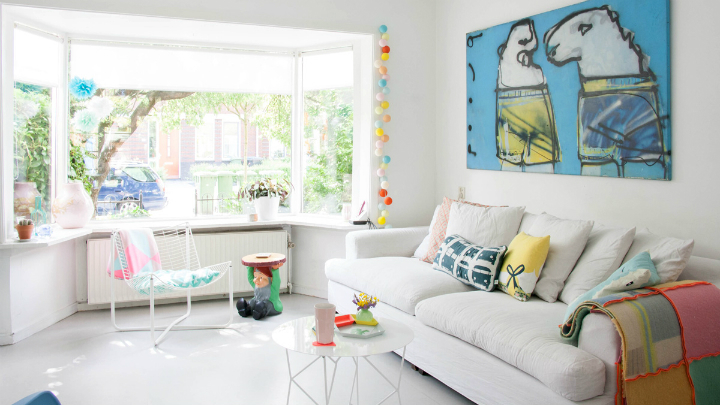 This home is located in the town of Arnhem, in the Netherlands, and is owned by Antoinette te Pas, your partner Henk Jansen and his two Teun and Roef children. With some Scandinavian style, its interior features with modern mix, all on a palette of very suggestive, feminine and quiet colors, with white backdrop and pastries as protagonists. A shelter conveys happiness in each of its corners. White is base color for the entire house, present in walls, floors and many of the furnishings. A base somewhat risky for a home where two children and a dog live, but it provides a lot light, serenity and purity to the environment. 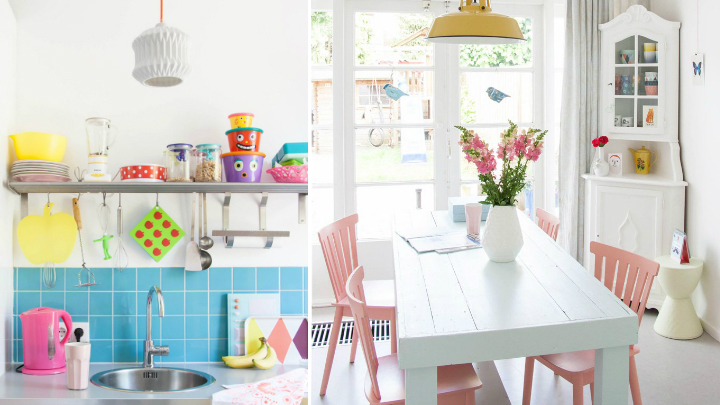 Color notes arrive with the rest of the decor, which squanders a lot of personality, joy and vitality in every corner. The couple bought this house of 125 square meters in 2001. During this time he has renovated the bathroom and the kitchen, has removed the wall separating the living room and changed the floor of the ground floor. The sofa is preferred for this family place, a space that often shares together. In the living room is the most prized possession of the couple: An original painting by Herman Brood found on the couch. In this room, too, it stands an amazing origami lamp in pink, a replica in blue color Eames chair and a sheet Zilverblauw. One of my favorite places is the kitchen. It is full of color and joy, with attractive tiled black and white tiles, wall tiles and slate blue. A yellow closet with double glass doors and accessories in very fun shades complete the decoration of this galley kitchen. The children of the couple share a bedroom located on the first floor of the house with a beautiful wall painted in green paper and an Indian tipi adorned with a necklace cotton balls made ​​by her grandmother. The bunk bed is the center of the room and makes different cozy areas within a single space. 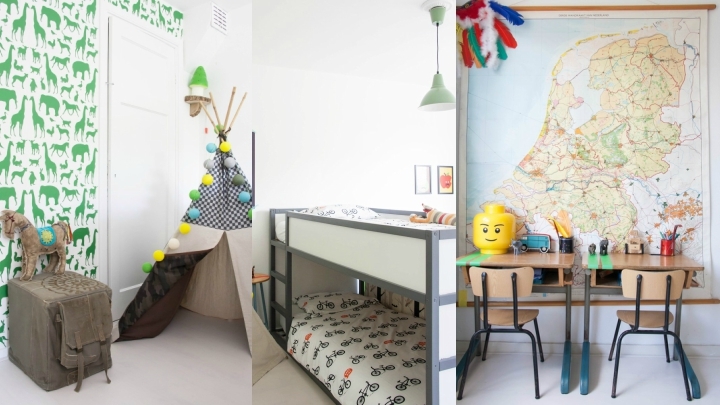 To the right of the bed there is a large map of the Netherlands on the desks of children. The master bedroom combines Nordic simplicity with touches of fantasy. The walls are adorned with sheets of Sammy Rose and feature a very cool mint green lamp with geometric lines. The bed and bedside tables are from Ikea.